We take a look back of the scouting reports written about Ben Roethlisberger ahead of the 2004 NFL Draft. 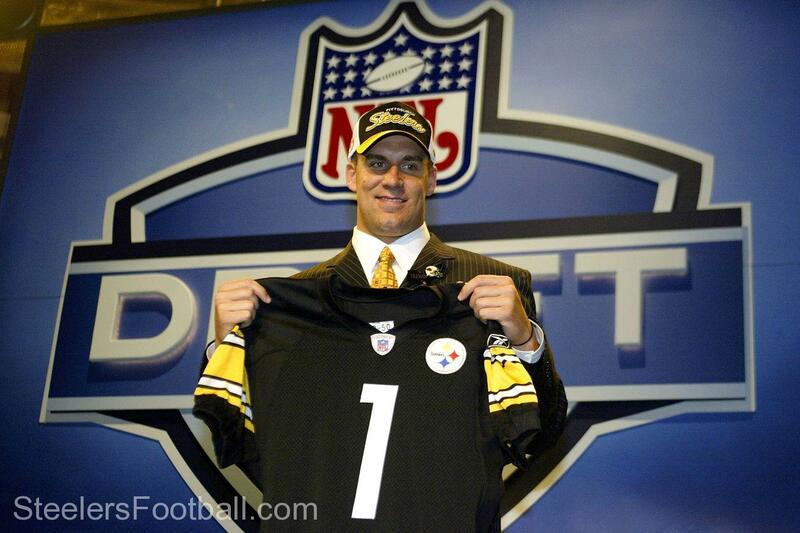 In a flashback to the 2004 NFL Draft, we take a look at how Pittsburgh Steelers quarterback Ben Roethlisberger was rated by the experts that year, and how accurate their projections about him really were. The Steelers have the 11th overall pick in the draft and Rivers is said by many to be the quarterback they are targeting. Most experts had Eli Manning ranked as the best quarterback available that year, with Roethlisberger generally viewed as the consensus No.2 over Rivers. However, this reprinted article from the Sporting News in 2004 was not 100-percent sure that Manning was the better player. This mock draft from The Sporting News on April 7, 2004, has Manning going No.1 to the San Diego Chargers, Roethlisberger No. 3 to the Arizona Cardinals, Rivers dropping all the way to No.20 and the Miami Dolphins and the Steelers ending up with Virginia Tech running back Kevin Jones at No.11. Ew! And unlike many of the young quarterbacks of today, Roethlisberger actually threw the ball at the NFL Scouting Combine when he went. Thankfully, things ended up a little bit differently and the rest is history, with several of these scouting reports painting a fairly accurate picture of the quarterback Roethlisberger would become. Positives: Tall, mobile passer with long arms, thick legs and good quickness, balance and change-of-direction agility … Shows good fluidity and quickness in his pass set … Very good at reading defenses, showing patience and the ability to pick apart zones … Has an above-average, snappy release and excellent arm strength … Generates good velocity behind his deep tosses and is equally accurate throwing from the pocket or on the move … Shows great poise in the pocket and is never rattled by pressure … While he does not have blazing speed to escape, he does show good mobility to roll away from the rush and step up to avoid the sack … Has the powerful leg drive needed to break tackles and move the chains when running with the ball … Has a compact throwing motion and excellent touch (knows when to take something off the ball, when needed) … Has a fluid over-the-top throwing motion and shows consistency throwing from the opposite hash … Will sit in and take a hit vs. the blitz, yet still make the proper throw … Would look to run at the first sign of pressure earlier in his career, but over the years, has settled down, showing patience in the pocket while trying to locate his secondary targets … Effective emergency punter who does a nice job of angling his kicks toward the sidelines. Negatives: Puts nice zip behind his passes, but his long ball will wobble at times (throws better from the right hash than left) … Needs to put some air under the ball when his receivers break open … Shows patience in the pocket but will try hard to make the play, resulting in throwing into coverage at times … Loses sight of his deep receivers when rolling out and on bootlegs … Despite his speed, he is not a great runner, relying more on overpowering the defender rather than eluding him … His deep tosses will sometimes take off at a low trajectory and high velocity … While he is quick to pick up the blitz, he needs to improve a little on reading zone coverage (needs to do more play action and misdirection, but shows confidence when his receivers work in man coverage, as opposed to the zone). From James Alder, NFL Draft expert at AboutFootball.com. From Sports Illustrated‘s NFL Draft Experts. And From the late Joe Stein, NFL Draft expert for the San Diego Union-Tribune. In hindsight, it is hard to imagine that the Giants and Chargers would not like to have a do-over on their selections for that year. © Copyright 1999-2018 EDG Virtual. All Rights Reserved Worldwide.